Start your journey at the TAT Tourist Information Centre, following Si Sanphet Rd. (see the map), to reach the first destination. See the way of life of the citizens of the old capital. Then take a stop to ask blessings from “Phra Mongkhon Bophit”, a sacred Buddha image of Ayutthaya at Wat Phra Mongkhon Bophit. Not far away is “Wat Phra Si Sanphet”. 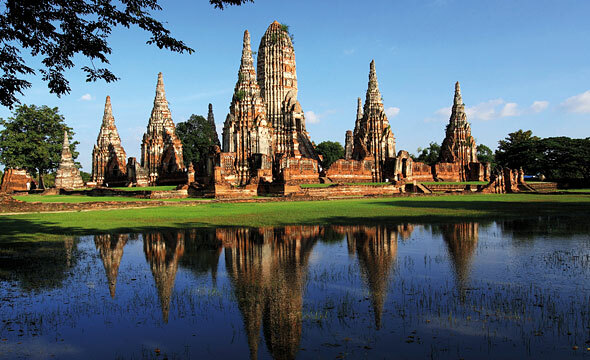 It is the most important temple of the old capital Ayutthaya. Inside is the ancient palace of Ayutthaya where the kings of old used to live, as well as where the various ceremonies were performed. Study the history of the 417-year-old palace once full of beauty and glory. 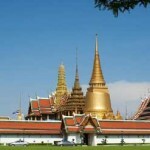 Then head eastward to the “Bueng Phra Ram”. This is where King U-Thong used to declare Ayutthaya as the new capital city. Take a relaxing ride pass “Phra Thinang Yen” (which is literally translated as either the Evening Throne or the Cool Throne) where the king used for watching the waterborne entertainment of the Ayothaya people. Continue onward to “Wat Mahathat”, a royal temple built in the time of Boromma Rachathirat I or Khun Luang Pa-ngua for containing the Buddha’s ashes. Before leaving the temple, do not forget to look for the “Buddha image on the roots of the Bodhi tree”, a place chosen by UNESCO to be a World Heritage Site. On the opposite side is “Wat Ratchaburana”, the temple that contains all the remaining treasures of the Ayutthaya kings after the capital city was sacked a second time. 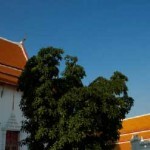 Part of that treasure is kept at “Chao Sam Phraya National Museum”. 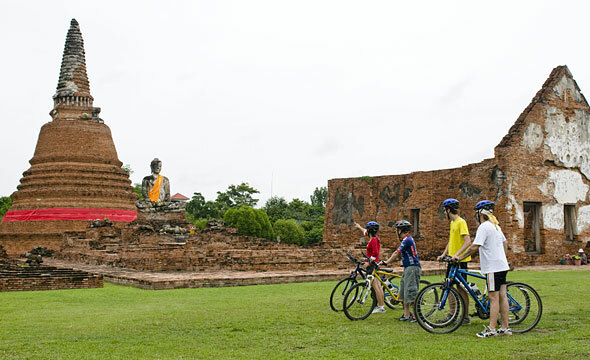 Now head northward to “Wat Thamikarat”, a sacred place believed to grant wishes to those that pray piously. 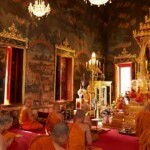 In the late afternoon, travel to “Wat Na Phra Merurachikaram”. Refill your energy with sweet, cold drinks while admiring the only remaining building of Ayutthaya’s beautiful architecture. When you hear the monk’s lunch gong, ride along the Khlong Sa Bua. Go to the pottery commune where they produce the “Nang Loeng Jars”, which are very large red uncoated pottery jars. After saying hi to the villagers and taking photos, move onward to “Wat Choeng Tha”. 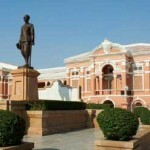 Located on the left of the Lop Buri River, it is where King Thaksin received his education during his youth. 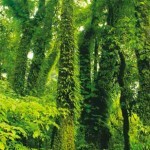 By noon you will have reached “Wat Lokayasutharam” or the Temple of the Reclining Buddha. It is known for the 29 m long reclining Buddha image created from bricks connected with mortar. Then have lunch or buy souvenirs. 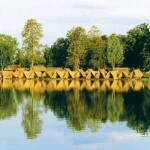 Afterward, ride back to the tourist information centre of the TAT which signals the end of your trip.